If you are a devoted human to your four-legged friend, you’d want to choose the one flooring that best suits their needs, Preferably, besides offering good enough support (for your pet), it should be also durable and easy to clean (for your own sake). In this blog, we have set out to help you on this hard but noble quest. To start it off, here are some general tips to help you select the best floor for your furry friend. Pet nails can scratch or snag and this can damage some types of floor. So you need to find a solution that’s most resistant to this danger. ing more than others. Trimming nails is not a solution either. Blunt, broad-tipped nails can still gouge the sealer, creating long, shallow dents. Forget floor runners, you definitely don’t have as much power over your dog (even if you believe you do). So it’s better to match your floor to your pet and not the way around. Once your dog has been trained it’s very rare that you’ll have to face this problem but if your pup is young there is a good chance that it won’t make it outside every time to relieve itself. In addition to unpleasant odor pet urine can leave bad stains. Some types of floors are better at dealing with that than others. All that dirt from running through puddles won’t just stay out. No matter how well-behaved your dog is, parts of it will definitely end up on your new floor. You have been warned./Consider yourself warned. So choose the floor that can be cleaned effectively without any fuss. 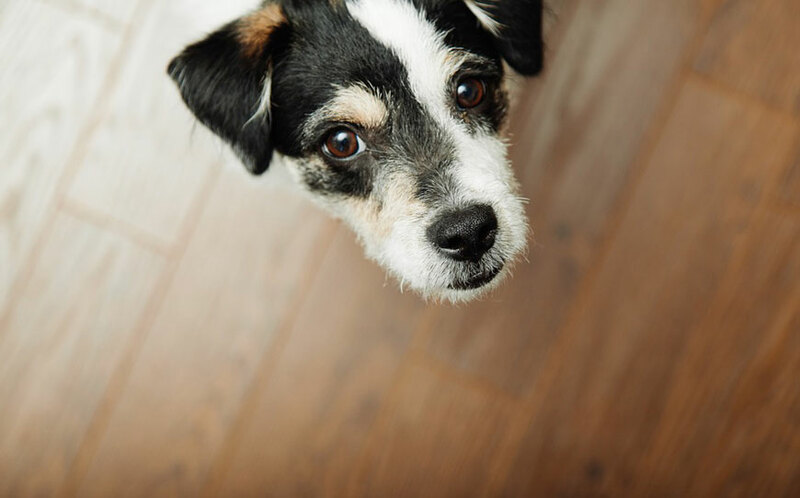 Allergies are a huge topic when choosing a new floor, but rarely in regard to our pets. Sadly, dog allergies are real and could put your four-legged friend in danger. You might not know of any existing allergies if your dog’s never been in contact with the irritant before. That’s why you should test/observe how a certain flooring material affects your pet beforehand. Still, most floor related allergies in dogs are a reaction to the floor cleaners and the chemicals they contain. Always use cleaning products that have been approved and are safe for your dog’s consumption. Because, you know, dogs like to lick everything. Woof, woof! Now that you’ve got an idea what to look for, we can move to selecting that one perfect floor for your little pup. Vinyl has proven itself as the finest example of resilient flooring on the market today. It’s full of controversies and benefits. Even though it offers soft enough padding to enjoy walking around barefoot, most quietscratches and liquid spills don’t faze it. Vinyl doesn’t trap dust or allergens and all you’ll need to clean it is a simple mop and warm water. Vinyl also happens quietest flooring option after carpet, something dog owners will definitely come to appreciate. The floors come in sheets and tiles as well as in all colours and patterns including different hardwood species and natural stone. Vinyl flooring is definitely a great alternative for those pet owners, who want to get hardwood floor but would like something more durable. Pros & cons for human: Easy to clean, can mimic natural materials but real hardwood still looks better. Pros & cons for dog: It’s soft and warm. No apparent cons. Ceramic and natural stone tiles are hard surface floors that can match your pet’s claws pretty well. They don’t scratch as easily as other floors and if they do the scratches are barely visible and don’t really stand out from the natural pattern. You dog’s mishaps don’t pose any problem either since both products can endure liquid spills when sealed properly and can be cleaned easily. The glazed option with extra protective layer may keep the water out more efficiently but its slippery surface can be somewhat uncomfortable for your dog to walk on. Cold too unless your place has underfloor heating. If you go with tile or stone be sure to put down rugs throughout the house so your dog has plenty of space to relax. Pros & cons for human: Scratch and waterproof as well as easy to maintain but colder and louder than other floors. Pros & cons for dog: Less allergenic and pleasantly cool in the summer months. However too hard to sleep on without a rug, requires underfloor heating in the winter. Laminate floor is designed to resist scratches. Its impenetrable clear top layer keeps the high-quality image layer underneath well protected. Like vinyl, laminate can mimic an array of natural materials including wood. A damp mop can go a long way when trying to keep your floor clean. However, that same wear layer that’s responsible for most of laminate’s advantages can be uncomfortable for your dog. It allows little to no grip and can lead to accidents, especially with older animals. It’s also louder than natural stone or ceramic tiles. It will amplify your dog’s footsteps like no other solid floor. So if you are an owner of an energetic breed you might want to skip this one. Laminate isn’t as hard as tile but not as soft as vinyl ether. For better comfort for your dog, you still might consider using rugs here and there. Pros & cons for human: Easy to clean, can endure scratches but can be loud. Pros & cons for dog: Warmer and more comfortable than tile but offers little to no traction at all. Wood and sharp claws don’t go well together. Resisting scratches and spills isn’t most woods’ strong suite. Trimmed nails can still damage the sealer, leaving behind long shallow dents. But if you absolutely have to have a wood floor, you could choose from these three options. Some wood species are naturally stronger than others. According to the Janka hardness test Brazilian Walnut, Hard Maple, Oak and Hickory floors have a better chance against your furry friend. Get a hardwood floor that has been already distressed. That way you won’t notice any new scratches. If anything they’ll add to the character of your wood floor! SoftPaws are applicable nail caps for dogs.They cover your dog’s nails to keep them blunt and harmless and protect your floors, doors and furniture from dreaded scratches.